The foam is caused by industrial waste. The images appear to show a snow-covered river. 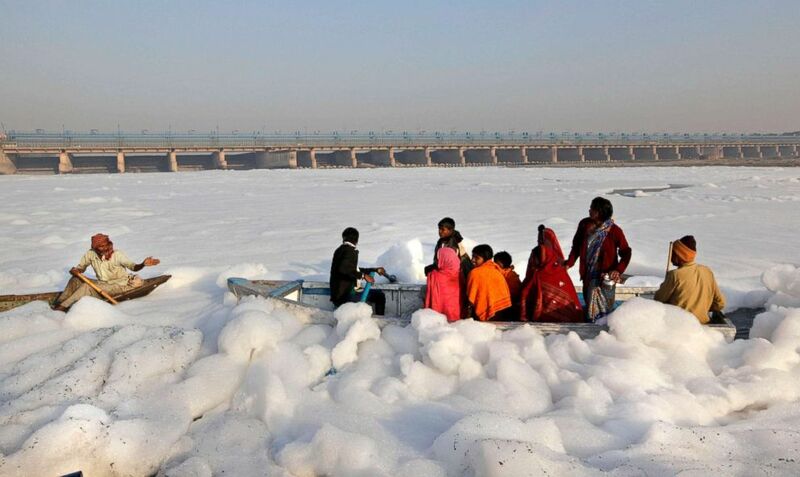 The reality is that stretches of one of India’s most sacred rivers, the Yamuna, are covered with toxic foam caused by industrial waste. 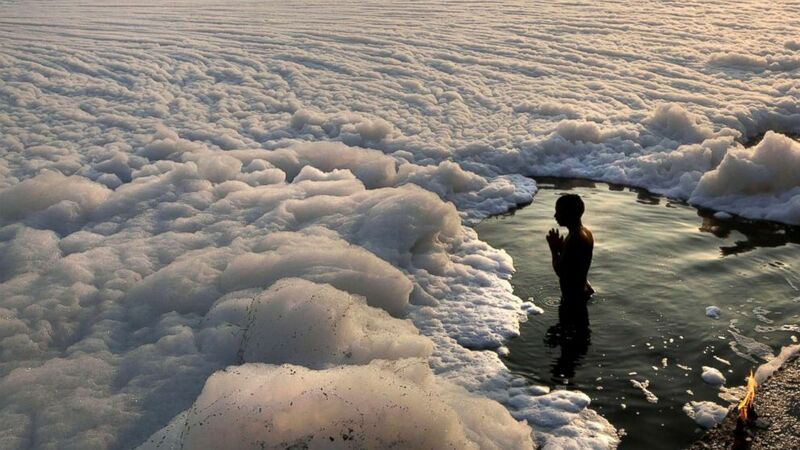 (Manish Swarup/AP Photo) A Hindu devotee offers prayers after a dip in the Yamuna river, surrounded by industrial effluent, during Kartik Purnima festival in New Delhi, Nov. 28, 2012. 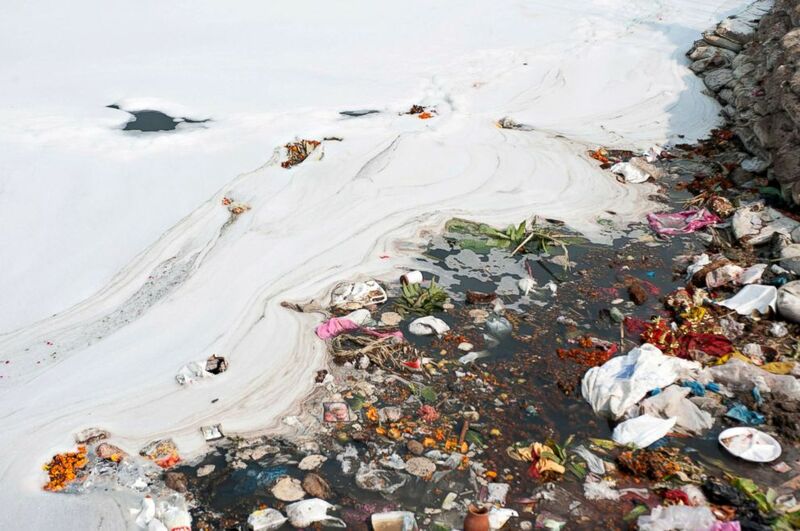 The Yamuna, along with India’s holiest river, the Ganges, are considered among the most polluted in the world. 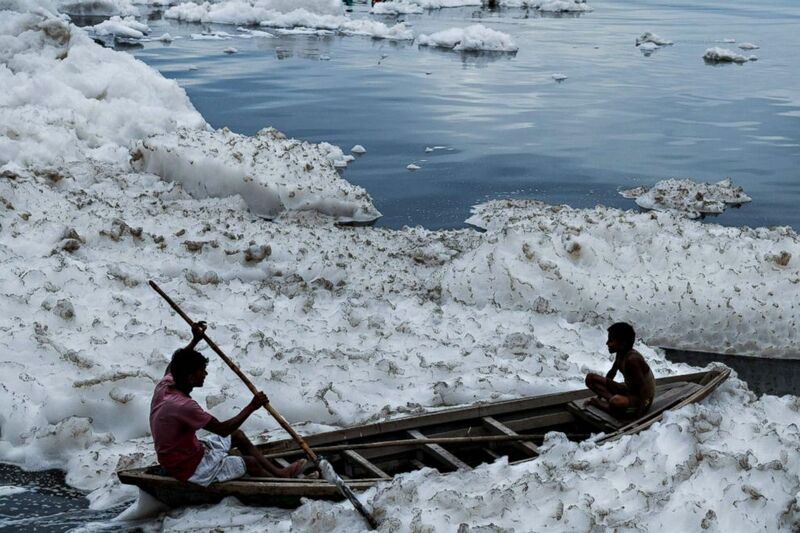 Activist Brij Khandelwal once described the Yamuna as "ecologically dead." Sewage from Delhi and other cities, chemical waste from manufacturing plants and pesticide runoff are all part of the problem. (Manish Swarup/AP) Hindu devotees cross the Yamuna river, surrounded by industrial effluent, on a boat during Karthik Purnima in Delhi, India, Nov. 28, 2012. Karthik Purnima is celebrated on the full moon day of the Hindu calendar month of Karthik and considered very auspicious by Hindus. Holy rivers are meant to be purifying. Indians perform religious ceremonies, bathe and drink from the 855-mile Yamuna. The river provides three quarters of Delhi’s water needs, posing a serious health threat to its 12 million residents and many other Indians who depend on it, according to The Associated Press. 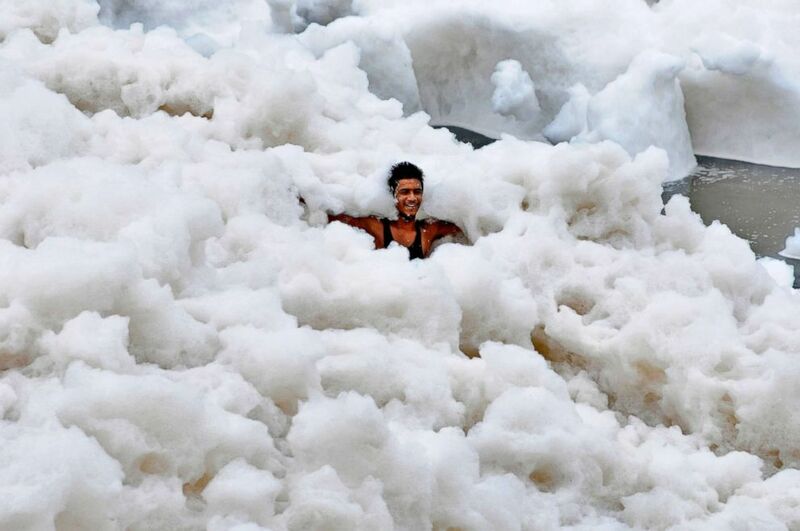 (Burhaan Kinu/Hindustan Times via Getty Images) A man immerses himself in a large amount of toxic foam formed along the banks of the Yamuna on July 12, 2015, in Noida, India. The pollution is caused in part to high ammonia levels emanating from the high discharge of industrial pollutants in the river. 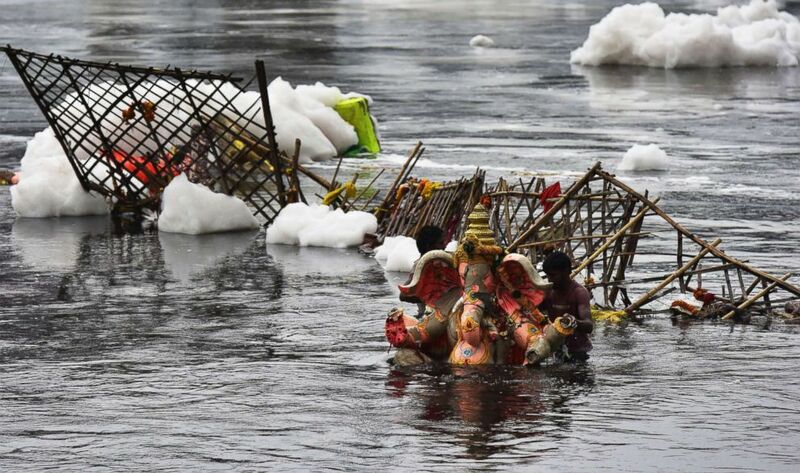 (Virendra Singh Gosain/Hindustan Times via Getty Images) A Ganesh idol is seen on the banks of the polluted Yamuna river, Sept. 24, 2018, in Noida, India. Lord Ganesh is considered the remover of obstacles and the idols are immersed on the last day of the Ganesh Chaturthi festival. (Haziq Qadri/Barcroft Media via Getty Images) Toxic waste and trash are seen in the Yamuna river in New Delhi, India, Nov. 20, 2015. (Chandan Khanna/AFP/Getty Images) Boys sit in a boat before immersing an idol of Hindu god Lord Ganesh in the polluted Yamuna river on the ninth day of the eleven-day long festival Ganesh Chaturthi in New Delhi on Sept. 21, 2018.